Alluaudia ascendens f. variegata hort. Origin and Habitat: Variegated cultivated form. The natural species comes from southern Madagascar. Description: The typical Alluaudia ascendens is a succulent or pachycaul treee reaching a maximum height of 15 metres, but it is usually far smaller. It grows initially as a single stem, but then branches forming massive ascending V-shaped crowns. 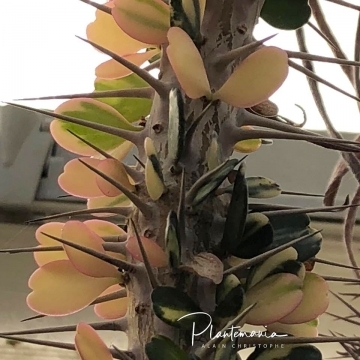 Variegated form: Variegated Alluaudia ascendens are cultivated for their beautiful foliage that has sectors, patches or stripes with two colours, yellow and green. The extent and nature of the variegation can vary, and sometimes the plant will return to the green form. Variegated specimens are sometime grafted on normal green specimen, called the stock. 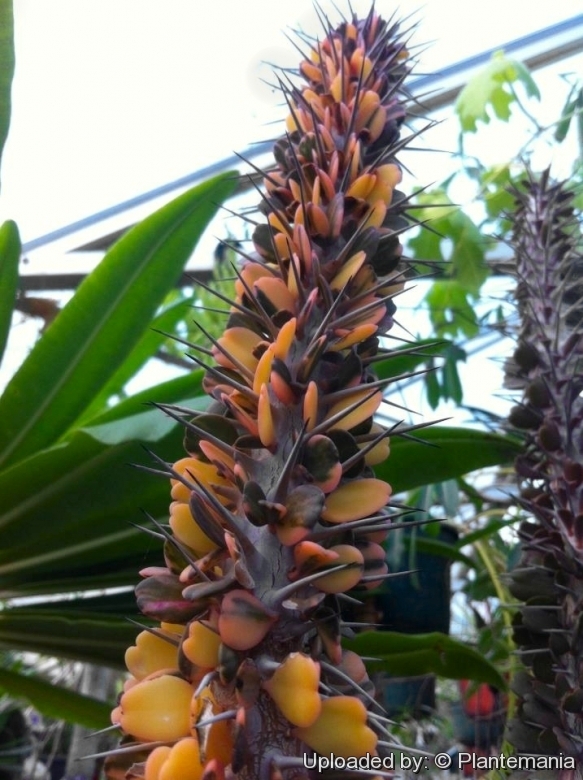 Alluaudia ascendens (Drake) Drake: forms a massive ascending V-shaped crowns up to 15 m tall. Spines single, 1,5-2 cm long. Leaves in spiralling lines circular or reverse heart-shaped. Distribution: S. Madagascar between Tsiombe and Taolanaro. Alluaudia ascendens f. variegata hort. : Variegated form. Cultivated. Cultivation and Propagation: Alluaudia ascendens is probably one of the most rare species in cultivation. Exposure: It needs full sun or high interior lighting with a very well drained soil mix and freely circulating air. Watering: Plants are watered and allowed to dry thoroughly before watering again. Hardiness: It is a frost tender species that must be protected in the greenhouse over the winter but established plants should tolerate temperatures as low as 0° C (Avoid any frost!). If grown in the home environment, the ideal temperatures should run between 20° to 30° C with winter time temperatures around 10°C. During the winter months, the plant will drop all of its leaves and no water should be given during this period. Maintenance: Not freely branching. Once this plant is established in its new pot, it should be cut back to encourage branching. The cutting removed can be rooted easily, and the process repeated. If pruned and kept somewhat pot bound, they can be maintained at a manageable size, depending on what ''manageable size'' means to you. If planted in the landscape however, It will often drop all its leaves when it decides to take a rest. When this happens, cut down on the watering until the leaves start to appear again. Garden uses: This is a terrific plant for those in warmer, drier areas who want something 'different' looking- maybe even a bit weird. Nothing is quite like it for adding interest to gardens, especially when plants are grown in multiples and allowed to create a mini-forest. It has some tough, sharp spines, but because of its very upright habit, is rarely a problem walking around. In Madagascar, the wood of the plant is used in building and for charcoal. 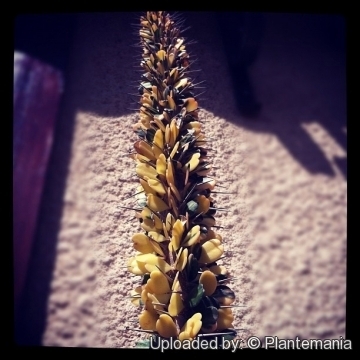 Propagation: Alluaudia ascendens is propagated from cuttings taken in the spring or from seed when available.